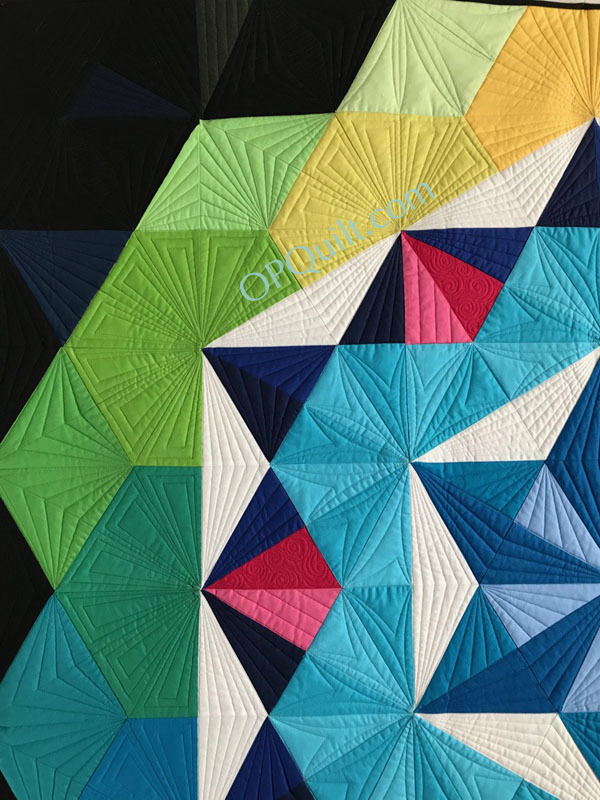 Posted on February 18, 2018 by Elizabeth E.
This is the story of the design of my quilt Annularity. It is also the story of Annularity II, which will hang at QuiltCon in Paintbrush Studios Booth. The story of this begins when I was contacted by the fine people at Paintbrush Studios, who make the ever-lovely Painter’s Palette Solids. I submitted one design for review, time passed, things changed; I thought the process was dead in the water. But I had all these lovely fabrics, so we started the process again. I played around in QuiltPro, my favorite quilt design program and came up with the above design messes. I showed them to Simone, seeking advice, and she said, “Don’t forget the white.” Negative space is critical, but sometimes you get in the weeds of a thing and you can’t see your way clear. I began building the quilt top, remembering the white. But when I got to the outer edges, something still wasn’t right. A designer can do all the designing they want to, but then the fabric takes over and slowly, the outer edges morphed from the planned design to what you see at the very top. Then there was the problem of the center. In the rush, I didn’t have all the correct fabrics, so some are pieced. But then I heard from Natalia that she had the quilt. Whew! 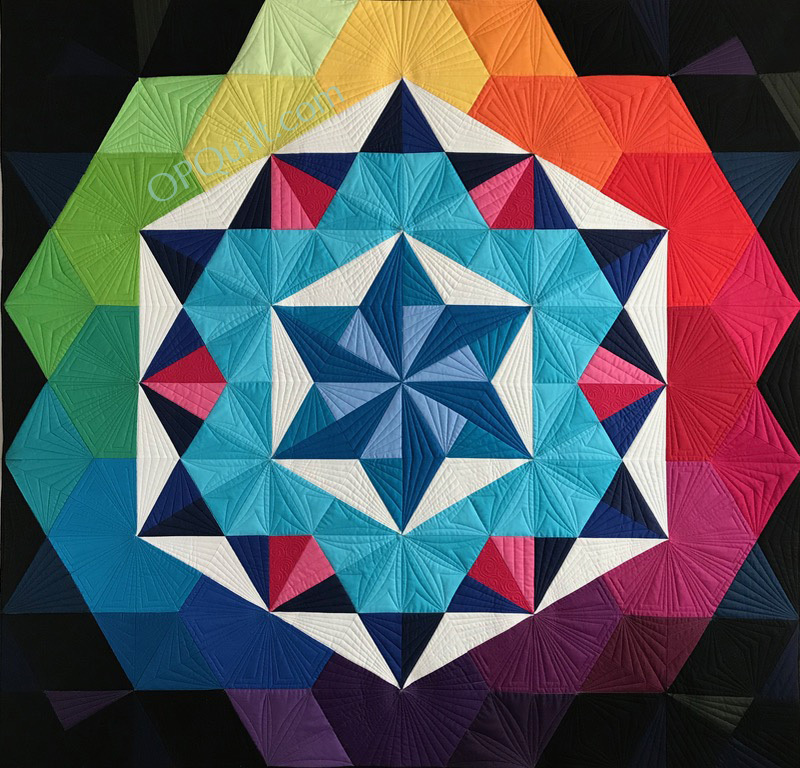 Since it’s going to be hanging in the booth at QuiltCon 2018 in Pasadena, I gave the first one a new name, since now there were two in the world: Annularity II. 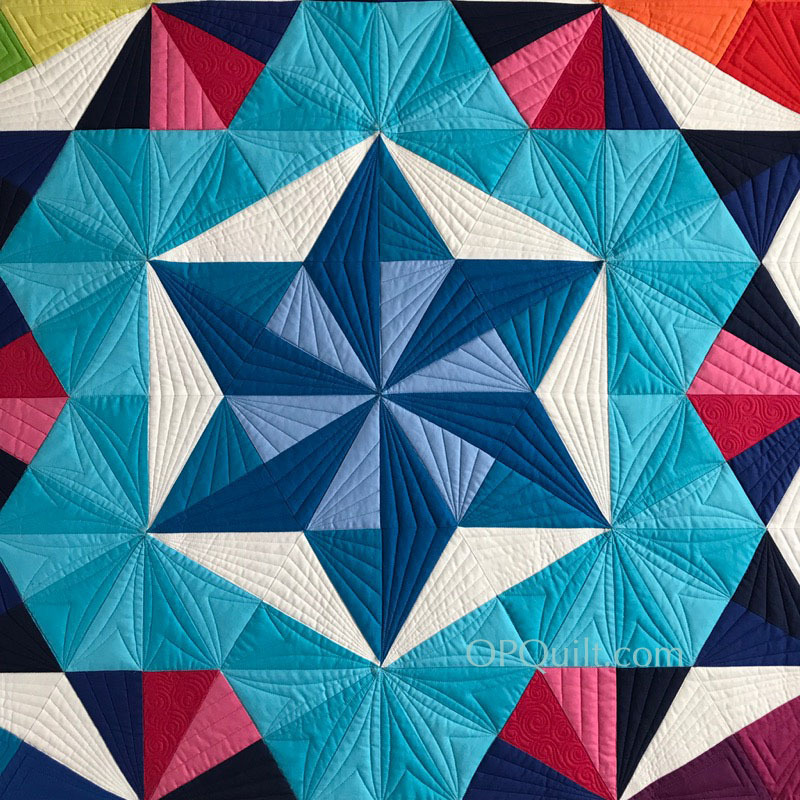 Pineapple Fabrics has the complete line of colors needed to make this design, and you can soon buy the quilt pattern from them. Come and see Annularity II in the Paintbrush Studios booth, #905. It is gorgeous. I love the quilting too. It reminds me of looking into a kaleidoscope. I can’t wait to see it in person. Such an incredible combination of color and pattern. The quilting is amazing, but can only enhance what is already there. Well done (again), my friend! Great design and there is nothing like Natalia’s quilting to finish it off! It’s just gorgeous! 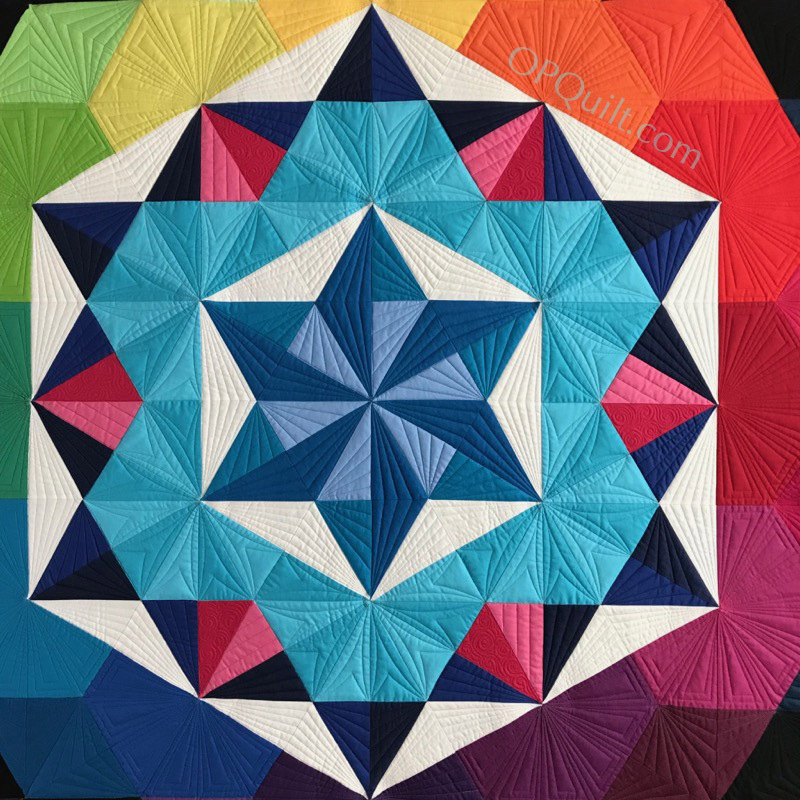 Beautiful work, both design and quilting! Fantastic. I love your process. I’m looking forward to seeing you and your quilt in person at QuiltCon. One of my life goals is to make it to Road to California or Quilt Con – both if possible. Maybe some day… In the meantime, I so appreciate being able to view them through your lens and filters – thanks so much for sharing! Beautiful!! Great design and the quilting really finishes it off so nicely. The comment about not forgetting the white made me laugh. I’m pretty guilty of using mostly mid values and not utilizing enough darks or lights. Oh wow, Elizabeth! This is truly a masterpiece! That design is really wonderful, and I admire you for creating it. Working with PP solids has to be THE BEST! I’m so happy for you to have created these gorgeous pieces… and to have been able to keep quiet about them for so long! I know that it’s not easy to blog and IG about other things when you’re hot and heavy working on something that can’t be shared. 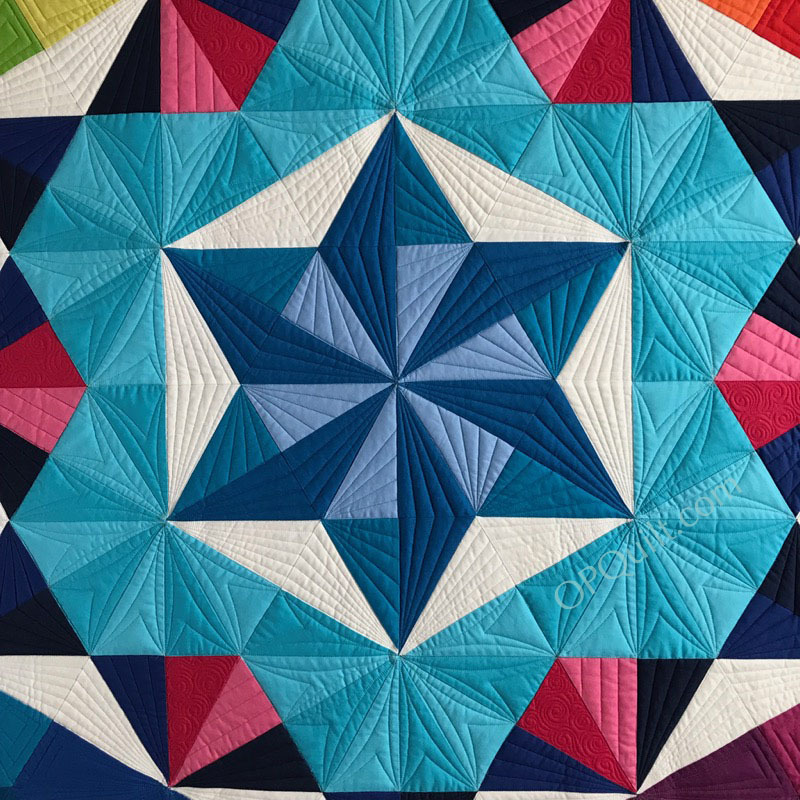 Natalia’s quilt IS great, and beautifully compliments your design. Great work! You should be very proud. A lovely quilt. I will look for photos of it hanging at QuiltCon. What a great story to read about your quilt. Of course there should be two of this beautiful design Elizabeth! Thank you for sharing your process with us. It is a real insight into your creative mind! 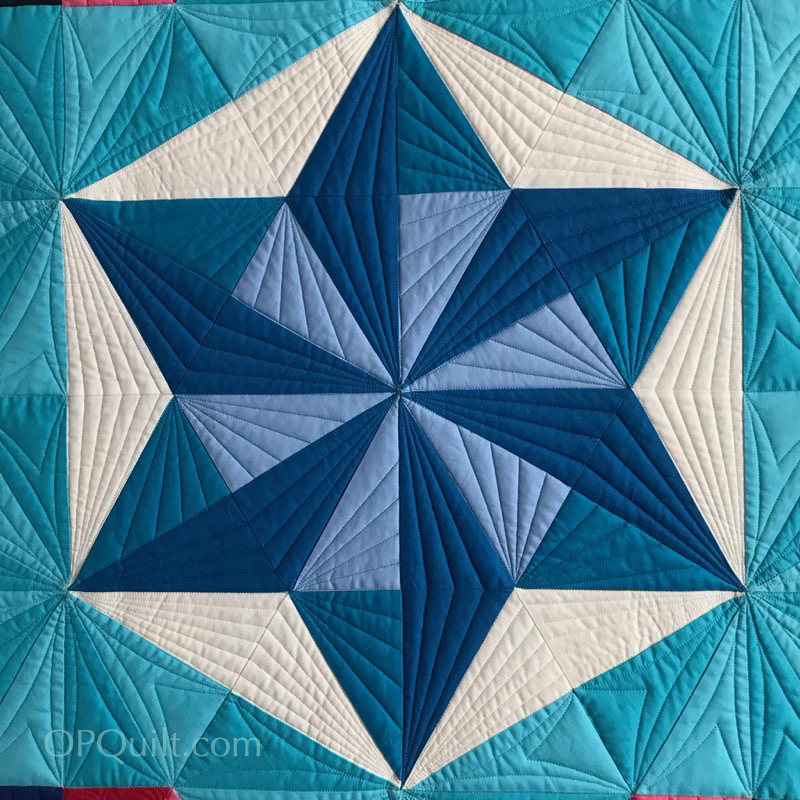 Natalie’s skilful quilting works so well with your lovely star! An exceptional quilt, Elizabeth. Sure to win a prize. The quilting is fabulous. What a gorgeous quilt. I can’t believe you made two! What an honor to have it at Quilt Con! Hope you are having a great time! 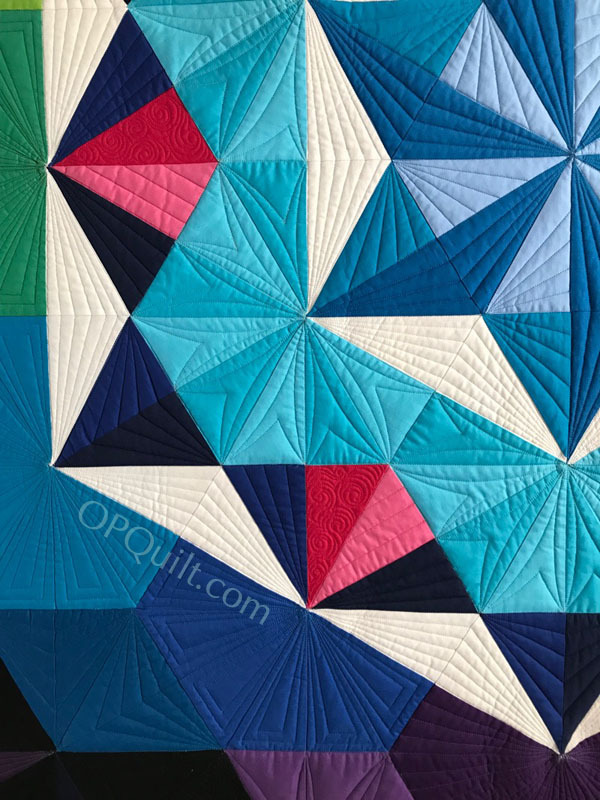 Each time you post a new quilt I believe it is now the best you have done. Can anyone continually improve on perfection? YES!! You can!! 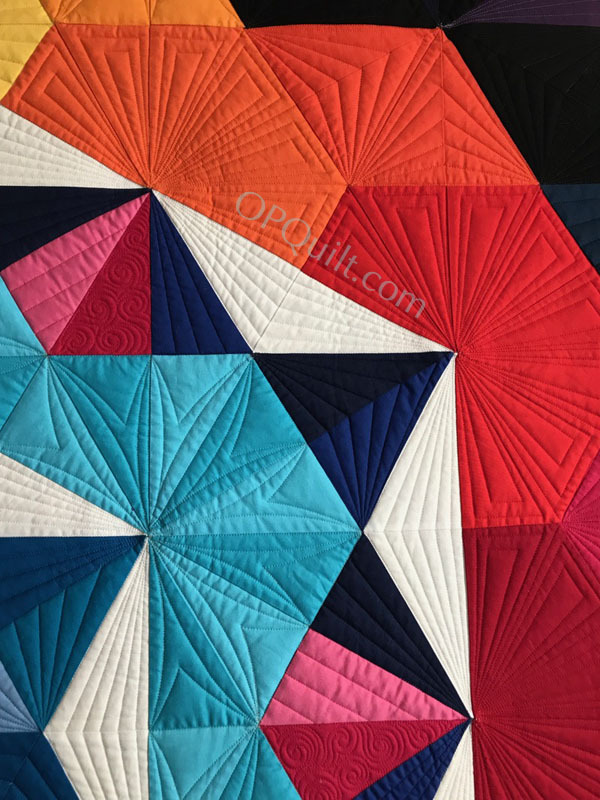 This quilt design and color combinations are absolutely fabulous! Thank you for sharing your masterpieces. They brighten my days!! !